Kate likes tofu. I’ve become used to it. 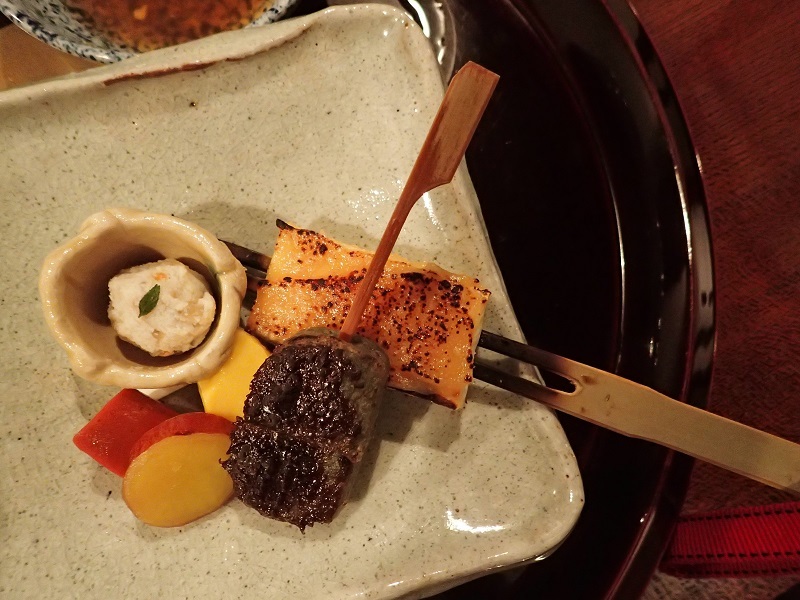 In Tokyo, I looked at the list of best vegetarian restaurants, and one of them specialized in tofu. So we went. This was a true restaurant experience. Kate ordered the vegetarian course (about 7 courses), and I had the non-vegetarian course (which was about 5 vegetarian courses and a couple of fish courses). The cost was about $50/person, so this was a real gastronomic experience. It did not disappoint. We had tofu in soup, which seemed familiar. The steamed tofu which we put in a soy dipping sauce was the creamiest tofu that I have ever tasted; it had the texture of ice cream. My personal favorite were the grilled versions. Here’s a photo. The larger of the two pieces was grilled with what tasted like a burned butter exterior. VERY tasty indeed with a crispy exterior and soft interior and delightful taste. The other piece was grilled but was smeared with what I believe was a black bean sauce (it could have been a tamarind sauce, but I think it was black bean). The taste combination was AWESOME. If American restaurants could cook vegetarian food like this instead of hard raw vegetables, they might actually become popular. In this regard I am on the same page as Anthony Bourdain. 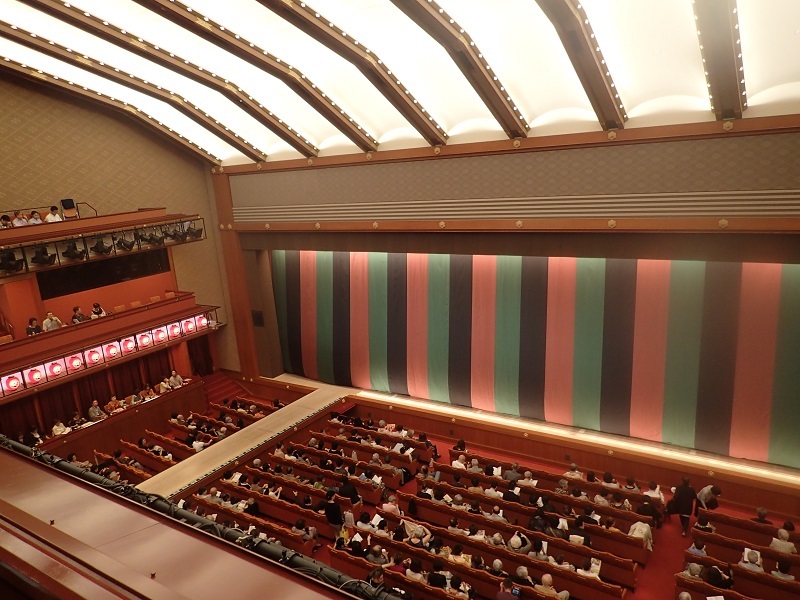 I am very glad that I finally to see Kabuki Theatre. Now I can say “that office drama is just like Kabuki theatre” or some similar situation! It was as animated as one might imagine. Heroes, demons, crying, people losing their heads for the good of the country. It was all that and more! It was a large stage. We could not take a photo with the theatre in action, but Kate took a photo before the performance began from the balcony where we were. We had great front-row balcony seats. They were less expensive and really allowed viewing of the show. The show was quite larger than life. Well worth the visit! I thought it was only appropriate that I post a photo of a pagoda since I was in Japan. 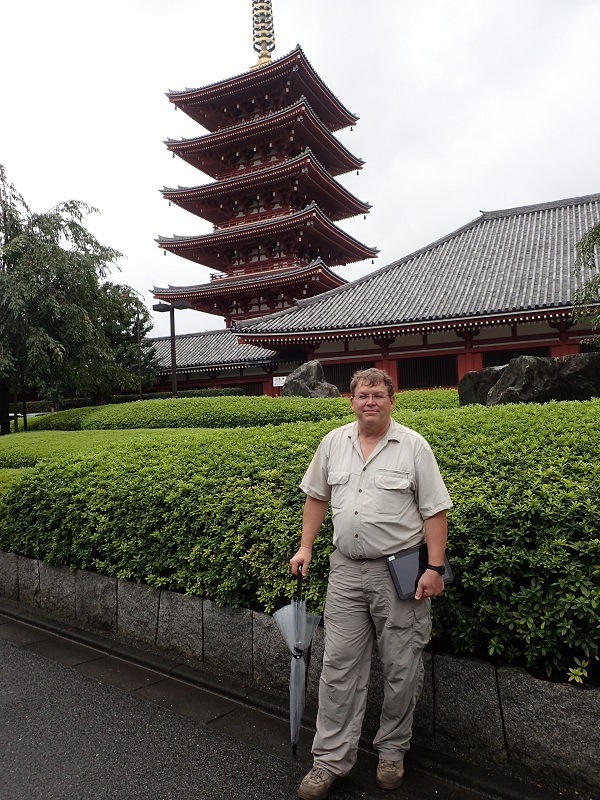 This is one that Kate took of me in front of a Kyoto pagoda near a large temple. I had heard that Japan had a lot of robotics. We were walking down the street, and I saw some inside a shop, and so we stopped. 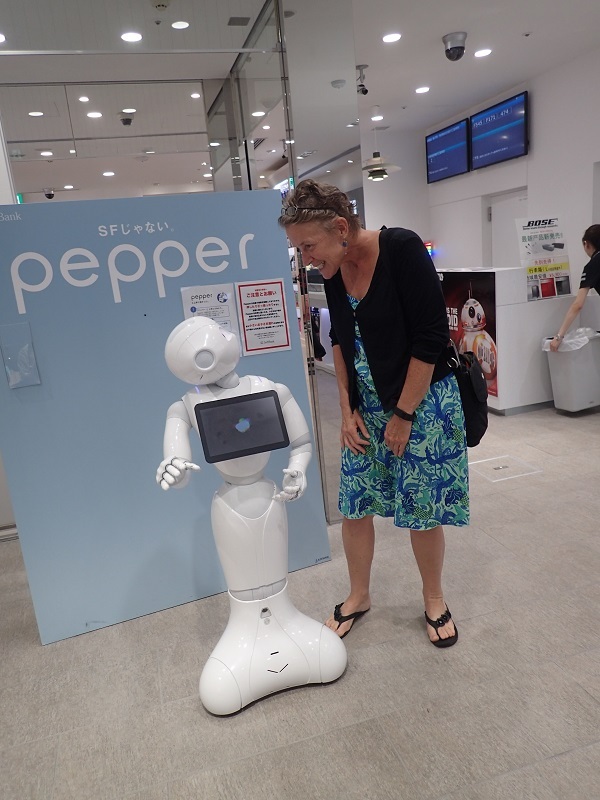 That’s Kate with Pepper, a robot that stood nearly 4 feet tall. It’s image processing was quite good and looked Kate right in the eye as she tried to communicate with it. Unfortunately, this robot understood only Japanese and so Kate didn’t get very far with communicating with it. However, we got a chance to see the new Droid robot from the next Star Wars film. 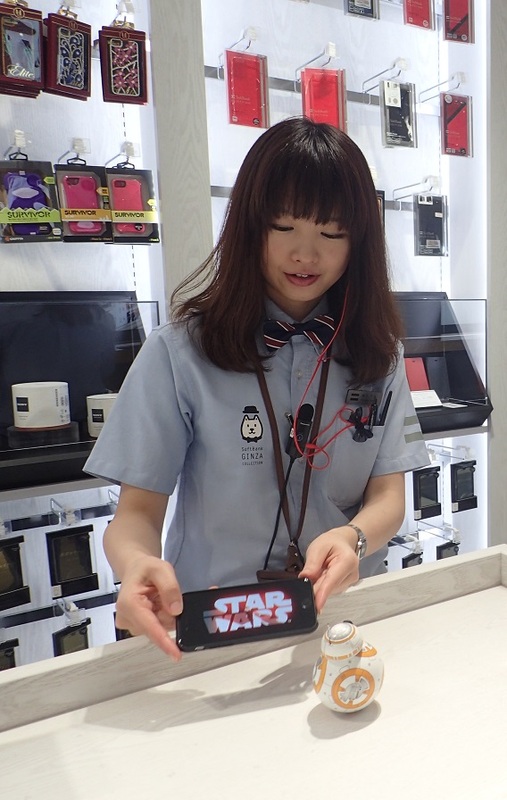 The sales clerk demoed it for us, controlling it with her cell phone. It was quite neat. The “head” of the robot rotated around the locomotion ball as it rolled around the room. Thus, the head stayed on top as it rolled along. One could guide it with the cell phone. This is quite an impressive little electronic toy — yours for $200! There are many things that I am missing here in Japan, but one of the oddest is the “Maid Cafe.” Here’s what I am talking about…. This is an image from the web site of MaidDreamin.com. We went into one of their cafes in Tokyo near the electronics district. Here’s the very strange deal. Twenty-something girls dress up as maids and serve food and alcohol to the guests. They act like they are in their early teens, and upon asked their age, will say something like “forever 14.” They clap their hands like little girls, squeak cutesy expressions in little girl voices, and draw pictures on your food when it is served (like a bear or a kitty). Most of the guests were kids the same age as the girls (early 20s) who seemed to enjoy the regression atmosphere. I guess the pressures of working in the big city as a young person meant that regression to an earlier age was welcome. Other than that, I don’t know how to explain it. There was one creepy sixty-something guy eating his lunch watching the maids. He appeared to know the girls, had his photo taken with them, and I suppose he was a regular. Creepy to me, but what do I know. If the people in the place were in their 30s and 40s, I would have had a different opinion about the place. But with the guests seemingly just kids playing the silly games that the kids who worked there were offering, I guess it serves a function. Very strange though. When I was 20, I wanted to act like a 35 year old, not 14. I hope I preserved the serenity of the place. And it is that serenity that was the subject of considerable thought as I walked around the grounds. There were hundreds, if not thousands, of people at the site. Yackety yackety yack. I found it somewhat amusing to think that this zen master practiced silence as a personal art form. 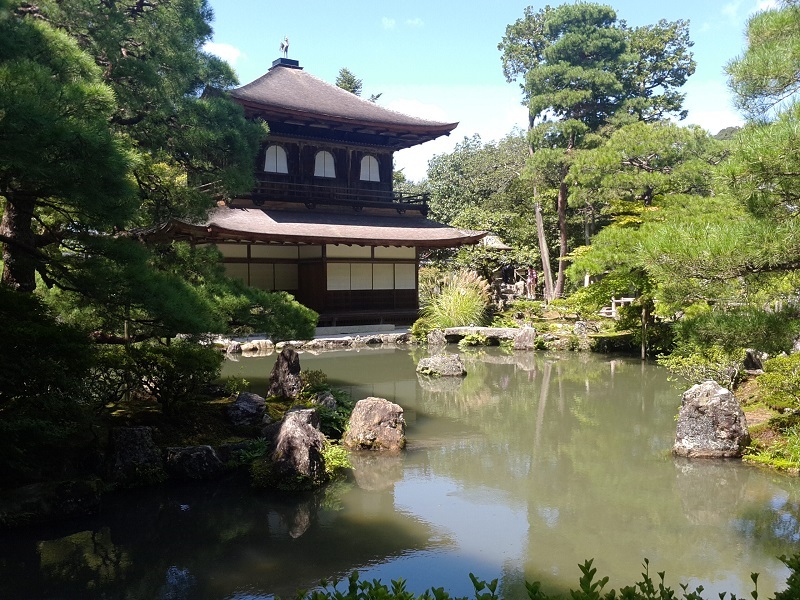 As a result of the UNESCO status, the grounds have now become the place of incessant talking and chattering as tourists and school kids carry on. Oh, I’m sure he would smile and be very Zen about it if he saw it today, so that made me smile. However, what was even somewhat more amusing in an ironical sort of way was the commercialism that lined the streets up to the gate of the grounds. Every manner of trinket, postcard, gadget, and green tea food could be found. As a site built to escape the materialism of the world, it has now brought that materialism to its borders and even within them. There is, after all, a gift shop inside the walls. And as you make the last turn to exit the grounds, there is one last stand hoping to make a sale. To the extent that the chattering might have made the Zen master smile, I am not so sure about the conversion of the grounds, especially the immediate area outside the gates, to a completely crass sort of commercialism. He might have to meditate about that! We came to Japan for a holiday, and we have been having a great time. First, I’ll comment on an interesting aspect of celebrity. Here’s a photo that I took of people photographing. The car is mobbed. As you can see there is a Geisha in the car. Geishas are basically entertainers who use the ancient arts to entertain their guests. They usually have skills like singing or playing traditional musical instruments. They are also taught in the polite ways of entertaining their guests (mostly men) by making them feel smart and manly through conversation, laughing at their jokes, etc. They have very expensive clothes. And years of training. As a result, they become celebrities of sorts. In Kyoto today, I led the way over to the part of town where Geishas might be seen in the evening coming from one of their venues. I thought that these women were sort of like animals in an open habitat, and people were there looking for them. 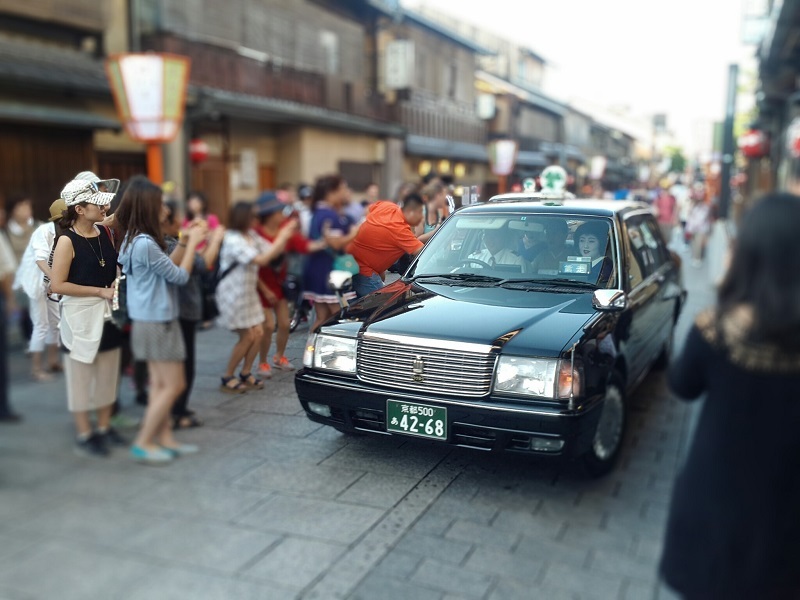 When I saw the mobbed car, it immediately confirmed my thoughts that these women were somewhat trapped by their own celebrity. They can’t step out of the house without being mobbed and gawked at. Do they ever get used to it? They certainly do not get to escape it.